A few weeks ago, I wrote an introduction to the Culture Cycle, a model for understanding how culture changes over time. Today, I’d like to give two examples of the Culture Cycle in action, specifically in the workplace. The first example is a real-life success story viewed through the Culture Cycle lens, and the second example is hypothetical. Hopefully, they will inspire you to play a more active role in your company’s culture! 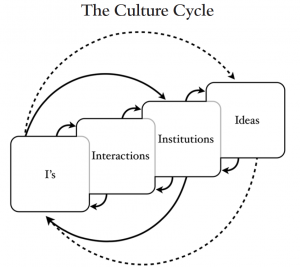 As a reminder, the Culture Cycle diagrams four levels of culture—Individuals (I’s), Interactions, Institutions, and Ideas—all of which shape one another continuously over time. In this article from The Washington Post, restauranteur Erin Wade describes how her company was able to largely eliminate instances of customers harassing the restaurant’s staff. Wade and her team almost certainly weren’t thinking about the Culture Cycle when they implemented this system. They probably didn’t have company culture on their minds at all. They were simply looking to solve an important problem at their restaurant. Still, I think it’s interesting to look at the problem and solution in terms of the Culture Cycle, since it touches on each of the Four I’s. To begin, Wade states her restaurant’s goals of inclusivity, diversity, and activism within the industry. This absolutely fits the bill for a cultural Idea, especially since it has implications about how the world should be, not just how the restaurant should work. Their solution was to take action at the Institutional level. They did not try to directly change the way customers and staff interact, and they did not try to directly change their customers, even though they were the root of the problem. Nor did they resort to firing managers for being unresponsive. Making a policy change was the right type of action because it effectively helped to re-align Individuals and Interactions with the company’s cultural Ideas. Of course, they could have made this policy decision while also trying to change the people involved, but they didn’t have to do so. That’s because the idea behind the policy change “trickled down” over time to Individuals and Interactions. The single policy change actually affected Individuals in a number of ways. Obviously, it made the staff feel more comfortable because it helped to guard against unwanted interactions. It affected management by providing a default reaction when staff experience harassment, which, in turn, made staff-manager interactions less uncomfortable. Lastly, it changed the behavior of customers, and maybe even drove some away (which is a good thing in this case). It’s also very possible that the policy attracted new customers who are more in tune with the restaurant’s culture, especially after receiving press like the story in The Washington Post. The effects don’t end with the restaurant’s Individuals, either. Their Culture Cycle is right in the middle of the dining industry’s culture, which of course has its own cycle. Wade notes that the restaurant industry has seen a shift in how people tolerate harassment, and she and her team have contributed to that movement while shaping culture in the process. Suppose that your company’s new goal is to promote sustainability within the organization. The Idea is to become less wasteful and more environmentally friendly. Most people like the idea of sustainability, but changing wasteful behaviors can be burdensome or even downright challenging. Placing recycling bins throughout the office is a good start, but becoming truly sustainable takes significant time and energy. How can the Culture Cycle be used to break this problem apart? Since businesses are already a type of Institution, that’s a convenient and familiar place to start. Some changes may involve the environment, i.e. your office space. For example, adding recycling bins to the office, putting locally-sourced snacks in the pantry, upgrading to an efficient HVAC system, or installing solar panels on the roof are all institutional actions. Other institutional solutions may be policy-based. Wade’s solution in the previous story is a great model of a policy-based solution. One example for this scenario would be requiring everyone to turn off their monitors and lights when they leave the office. Another would be to pay for bicycle maintenance for employees who bike to work. These policies are essentially carrots and sticks to nudge people’s behavior toward a goal. They’re technically extrinsic motivators, but they can have a real effect on culture over time. Now let’s look at how Individuals and Interactions could affect this initiative toward sustainability. After all, most people in most companies don’t have the authority to change institutions on a whim. But as an individual, you create the basis for culture–company policies don’t mean anything if you don’t follow them. The advice here is pretty straightforward: To support a culture of sustainability, act sustainably! Use the aforementioned Institutions correctly, and encourage your peers to do the same. If you’re already supporting the cause, then it’s up to you to reflect that in your Interactions. This doesn’t just mean telling your coworker that their Hummer is contributing to climate change. It means setting a good example and actively looking for ways to make your own actions more sustainable. Conversely, people who don’t promote sustainability are going to hinder the process. This is especially true if they’re influential within the company. If someone who’s well-regarded pays no attention to the recycling bins and jokes about how much food they throw away, their coworkers will feel less bad about doing the same thing. Luckily, given the way culture works, if everyone else already has a sustainable mindset, then the wasteful person probably won’t be very influential. And if everyone already agrees with that person, then the company probably wouldn’t be promoting sustainability. But if everyone’s behavior is more evenly split, the company needs to enforce its new policies to get the desired results. In fact, two of the most powerful cultural tools are hiring and firing. Neither of those is an easy process. But being careful with the former can help to avoid cultural mismatches which lead to the latter. Obviously, thinking about the Culture Cycle isn’t the golden ticket to making everyone behave the way you want. But from the perspective of an employee or business owner, considering the Four I’s can be a great first step for tackling a Culture-centered problem. And simply focusing on the right level of culture, as Wade did at her restaurant, can yield big results. I hope that these examples can serve as a guide for problem solving through a cultural lens. If you have any stories about changes in your organization’s culture, please tell us about it in the comments!